Here’s a free language course: “Kkongdon” is literally Korean for “best price value”. 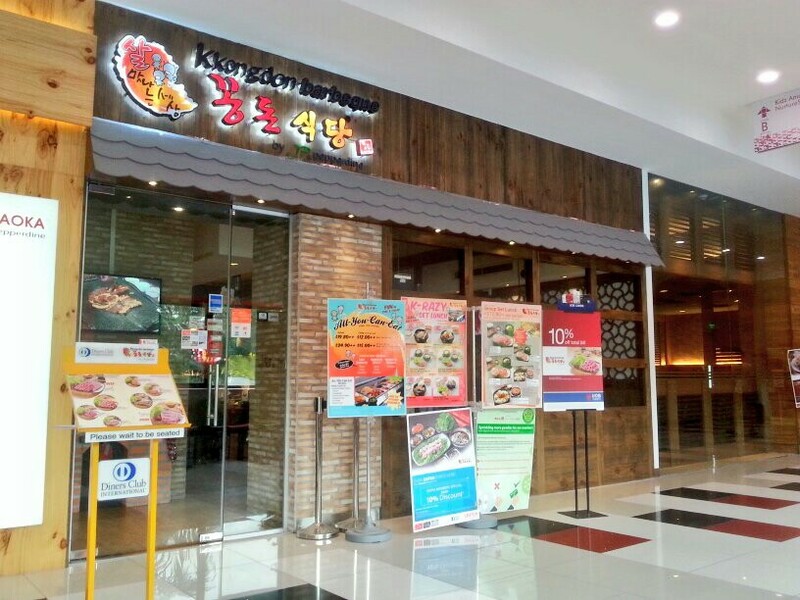 In the span of just 9 years, the Kkongdon Barbeque chain has grown from just one humble restaurant located at Sinchon, Seoul, to an impressive 67 outlets throughout Korea. The JP Pepperdine group (also behind Jack’s Place and Eatzi Gourmet) has had a part to play in bringing the Korean chain here to our shores. With four outlets in Singapore situated at Djitsun Mall @ Ang Mo Kio, Marina Square, Parkway Parade, and SAFRA Toa Payoh, the Kkongdon chain is set to become a household name in the years to come. Kkongdon invited us down to sample their new streamlined menu, an overhaul of the items offered to suit the palates of locals here. 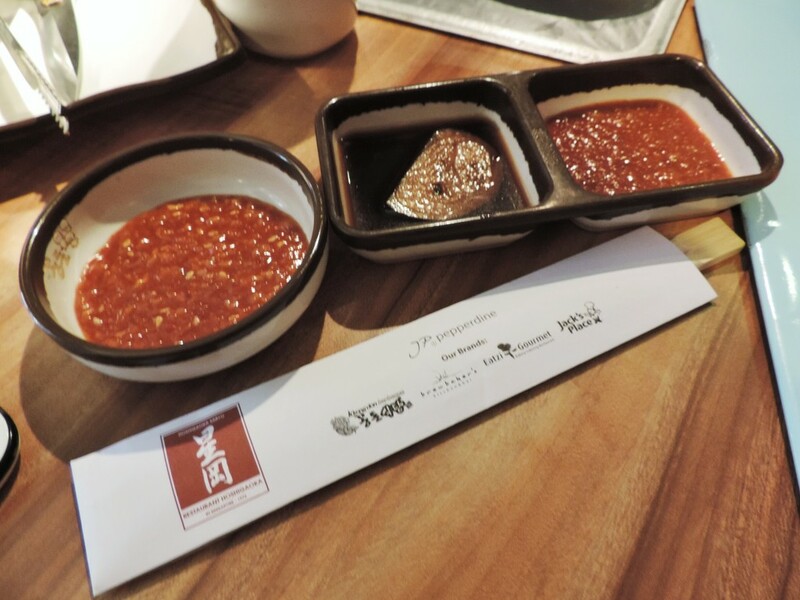 The most popular items chosen by past customers are now the main stars on the tailored-for-Singapore menu. Think Marinated Pork, Kimchi Pancake, and everyone’s comfort food: the Ginseng Chicken Soup. When we visited Kkongdon’s Toa Payoh branch for lunch on Monday a few tables were already occupied by couples and small groups. The outlet holds an excellent location with high human traffic, sitting right between Astons Specialties and Restaurant Hoshigaoka (also from the JP Pepperdine group). Being located within the SAFRA premises also means that families are the most frequent customers, with their toddlers and kids in tow. 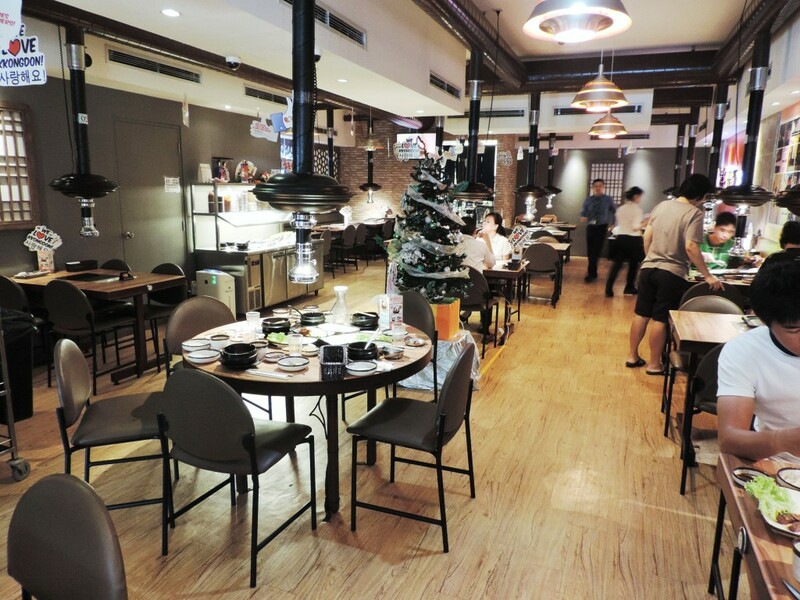 Plenty of space to walk around… no worries about spilling your kimchi on other diners here! Kkongdon has tables for groups of 2 to 10 people, although I’m pretty sure eating alone is not an issue either. All tables come with their own open-face grill (no, not the one that rappers wear on their teeth) and exhaust fans in the form of tubes suspended from the ceiling. The exhaust tubes also come with powerful LED bulbs which ensure that all your photos turn out well-lit. Nicer #foodstagram = More likes. SCORE. Okay so on to the food. 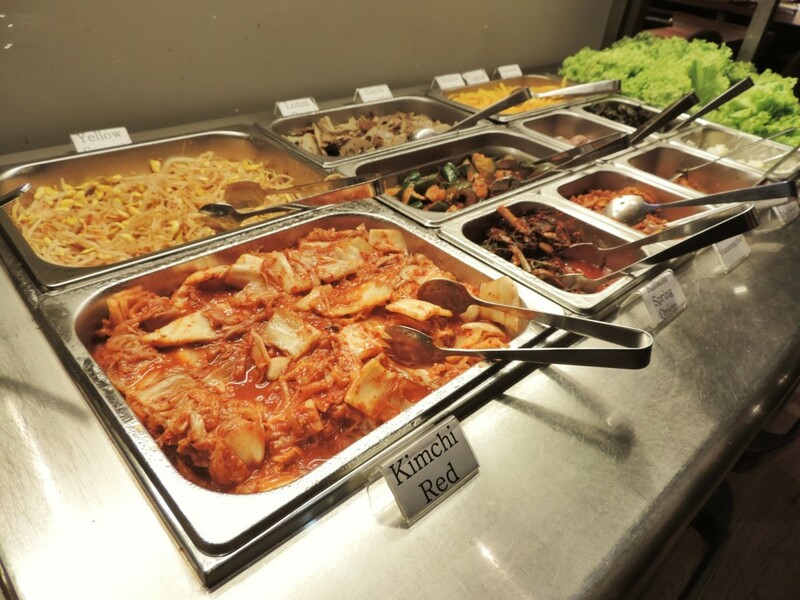 No self-respecting Korean eatery would be caught dead without a plethora of appetiser side dishes, and Kkongdon takes it a tiny step further by offering these treats buffet-style. Naturally, I overdosed on the creamy potato salad. 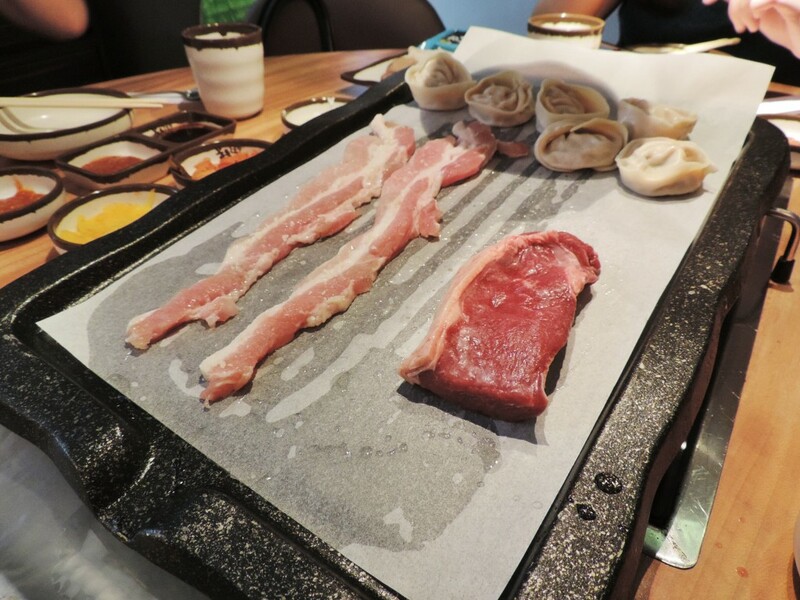 Grilling in Kkongdon is rather different from other barbeque chains. For starters, we grill over paper. It’s a magic trick. It’s a time-saver (for cleaning). It’s grilling over a piece of paper! To be totally accurate: we grill over greased paper. This prevents burnt meats and other gritty things from sticking on the grill surface directly, and also makes cooking more hygienic for other patrons (while taking a considerable load off the dishwasher’s shoulders). Alternatively, you can also request for the kitchen to cook your meats directly, which families with young children might be thankful for. 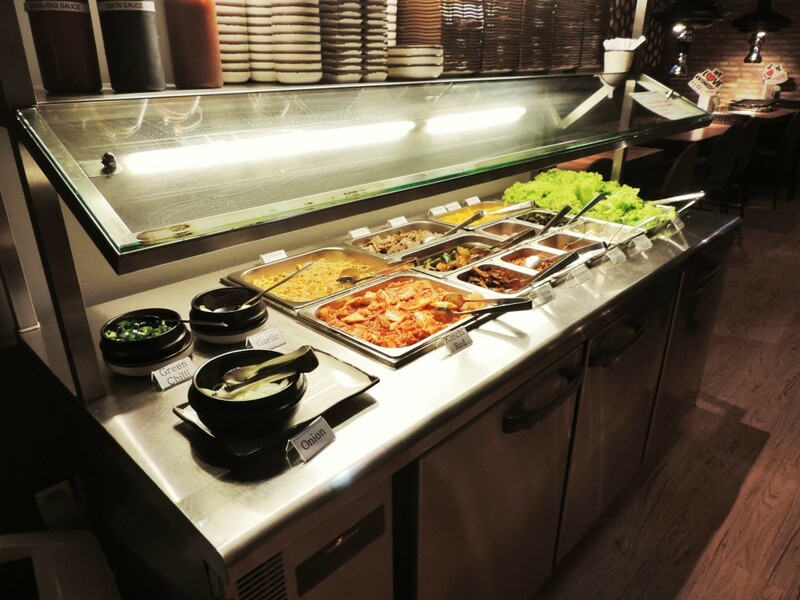 The service staff are extremely polite and would definitely accommodate your requests. Go ahead and wrap meats up with lettuce and make a small mess! Kkongdon offers three meats in three different marinades, and with three dipping sauces (see a pattern here?) to slather said meat in. 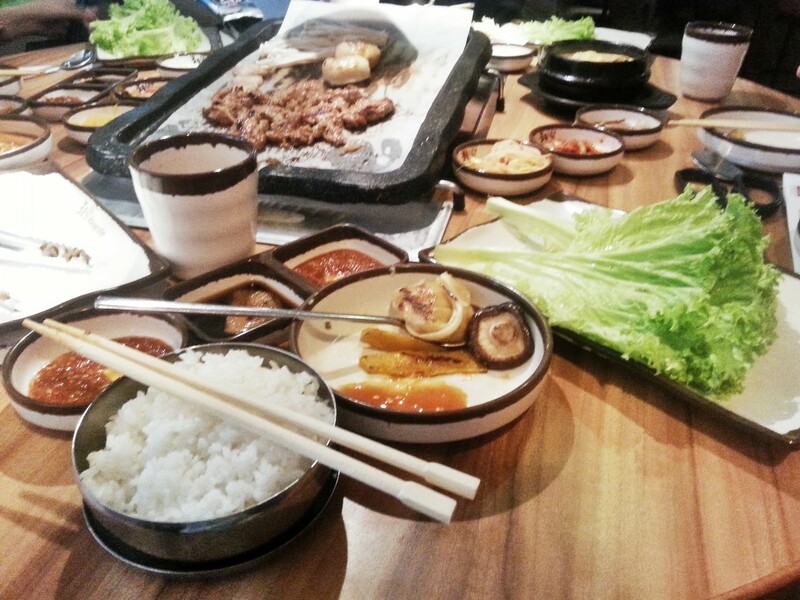 Chicken, beef, and pork can be ordered in three styles: “Light(ly) Marinaded“, “Marinated (Spicy)“, and “Marinated (Bulgogi)“. Don’t worry about the “60MIN”: that’s just the time limit for ordering. You can stay for free kimchi if you’d like! 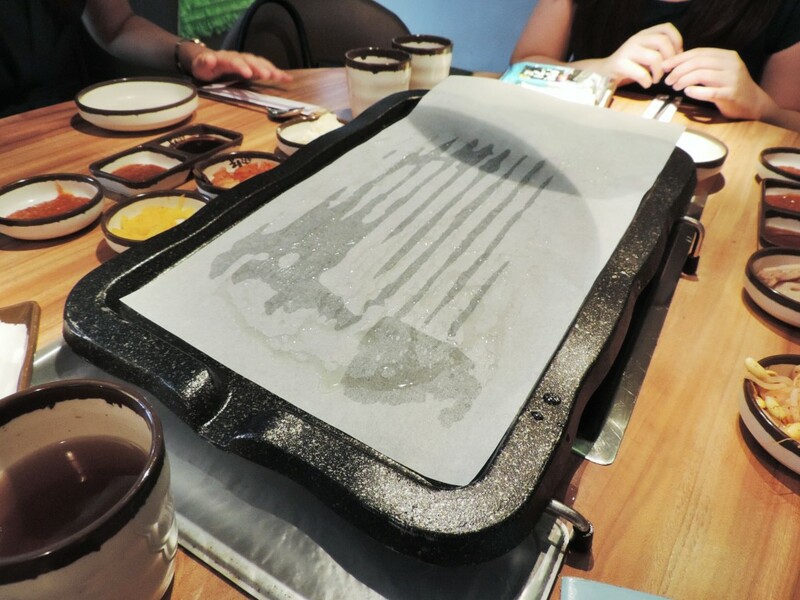 Three sauces are offered here: the “Ssamjang Sauce“, the “Onion Sauce“, and the “Garlic Ssamjang Sauce“. The latter was introduced to appeal to local tastebuds, and is a lighter and tangier version of the original “Ssamjang”. Spoiler alert: it tastes pretty close to chicken rice chilli. We started off with the Light Marinated Pork; long, nicely-marbled strips of meat that were probably the best among all the cuts that we tried. Life hack: it goes PERFECTLY with the Garlic Ssamjang sauce. We also had the Gyoza, or Korean dumplings, which were a tad oily, but you’re not here at a barbeque joint for health, are you? The Marinated (Spicy) Beef lived up to its name and just a few small bite-sized pieces left us (or me, at least) sweating in the cool, air-conditioned restaurant. Want to challenge yourself? Go ahead! But stay clear if you’re on a first date. On top of that, we also tried the Marinated (Bulgogi) Chicken which was garlicky and nicely done (but that was our effort). It tasted a tad boring but that might have been because of the Spicy Beef we had right before this. 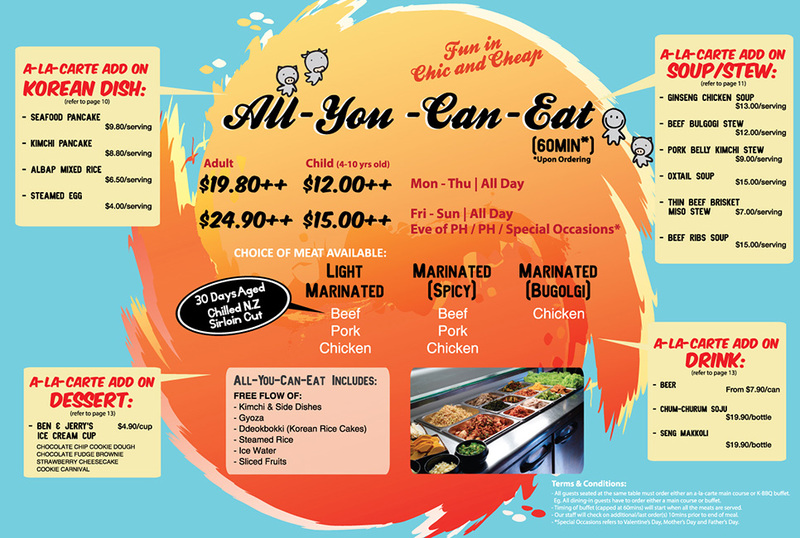 In any case, a great choice for younger diners… the kids will love it! But the other non-barbequed items on the menu also stole the show. 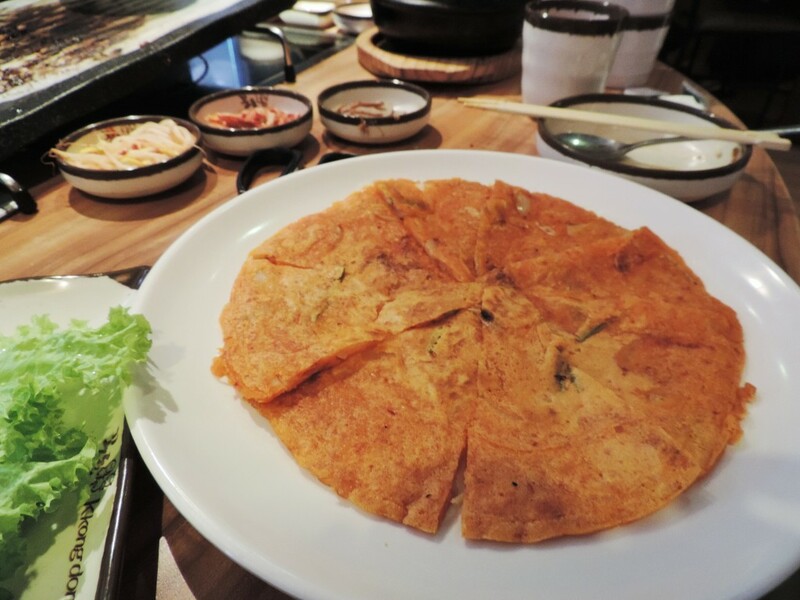 The Kimchi Pancake ($10.80 a la carte/$8.80 add-on) was larger than expected, almost like a giant omelette. Tip for parents: if your kids are picky eaters this can easily pass off as a pizza… and maybe even tastier! 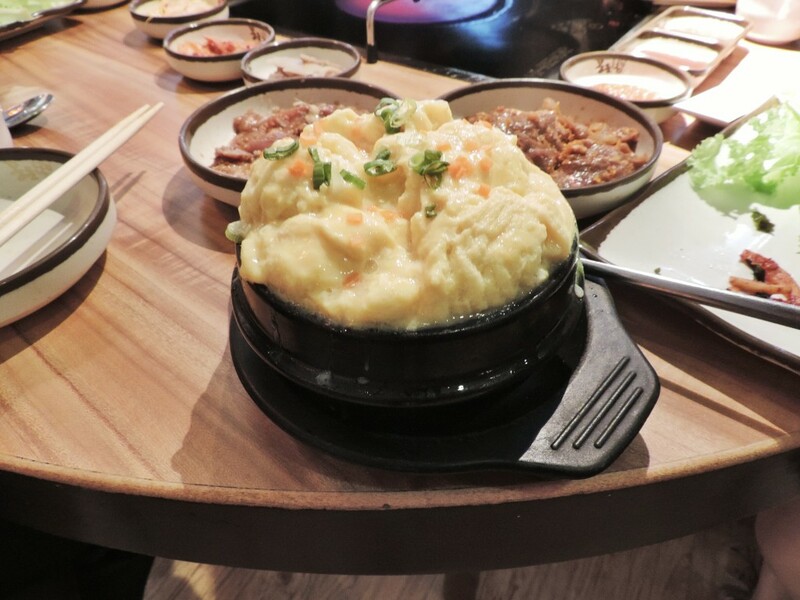 The frothy Steamed Egg ($6/$4) is an unassuming signature dish, but looks just as amazing as it tastes. 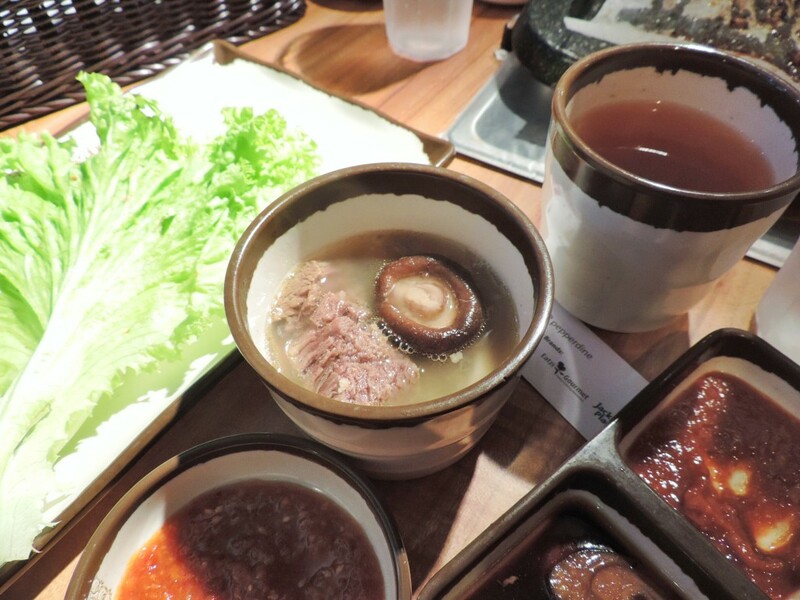 To wash down the meal we sampled two of the most popular soups: the Beef Rib Soup ($17/$15) features shiitake mushrooms, enoki mushrooms, and delightfully-large chunks of beef. This rich and robust broth is easily one of the best um… liquids I have tasted in my nineteen years. Definitely a must-try. (Maybe) skip this: the Chicken Ginseng Soup (w/ optional Soju) ($18/$13) paled in comparison to the flavourful Beef Rib Soup we had prior to this. While the addition of soju (rice liquor) is an interesting touch to the popular Korean dish, the soup was a tad dilute and lacked the heady tones of herbal ginseng. But on the other hand, this may appeal to those who dislike Chinese herbal soups for their overpowering flavour. Armed with this brand-new selection, Kkongdon Barbeque is great for families, small groups, or just a simple but filling lunch alone. Bonus: if you’re a K-Pop fan you’ll be thrilled to learn that this outlet has a flat-screen TV dedicated to playing an endless stream of K-Pop music videos. Drop by today!